This recipe for Coconut Shrimp and Mango Sauce is on the menu at Fredy’s Ocho Tostadas. When I get back home I will try and decipher it in more precise measurements. Until then it looks like a great dish for New Years and could easily be down with Monk Fish or other white meaty fish (even chicken). 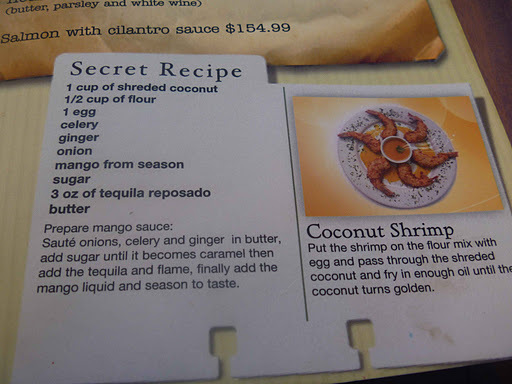 This entry was posted in Recipes, Travel and tagged coconut shrimp and mango sauce, Puerto Vallarta, recipe, restaurants. Bookmark the permalink.